During the school summer holidays, join us as we embark on a fun pirate themed trip through historic Newbury aboard the ‘Pirate Galleon’ Jubilee. Come dressed up as a pirate – Jubilee and crew will too! 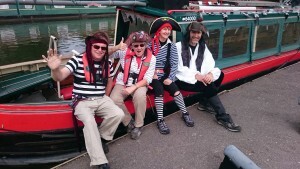 There is lots to see on the trip as we have fun being pirates on the canal and there is a quiz on the return journey. We advise advance booking on these popular trips to avoid disappointment but tickets may occasionally be available on the day. 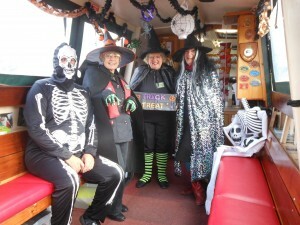 Enjoy a half term Halloween boat trip. Trips take approximately one hour and children will enjoy a ‘spooky’ story, a Halloween quiz and, for those who dare, a chance at our ‘trick or treat’ box! Jubilee will be decorated for Halloween and the crew will dress up so we hope you will dress up too! We advise advance booking on these popular trips to avoid disappointment but tickets may occasionally be available on the day. We’ll be cruising to ‘Greenham Land’ to find Santa! 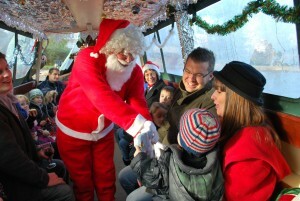 Children enjoy a Christmas story, singing, and plenty of time with Santa during the boat trip which lasts approximately 1 hour. The ticket price of £9 includes a good quality present from Santa for children; and the choice of mulled wine or hot drink and a mince pie for adults. Advance booking is essential and tickets will not be available on the day. There are no concessions. Please dress warmly for this trip and don’t forget your Christmas hat! Cost £9 (no concessions) and trips are at 10am, 12 noon and 2pm on Saturday 15th, Sunday 16th, Friday 21st, Saturday 22nd and Sunday 23rd December 2018. Please note that in the event of severe weather the boat may not be able to leave the wharf and an alternative programme will apply.